Propaganda comprises most media in the Democratic People's Republic of North Korea (DPKR), established on September 10, 1948. The communist Korean Workers' Party (KWP) was organized two years earlier. Since the Korean peninsula was divided at the thirty-eighth parallel after World War II, the communist-controlled northern half has utilized the press to achieve political control and dominance over the populace of approximately 21 million people, primarily peasants. The North Korean media has also manipulated the press to portray certain images of North Korea to its allies and foes. Circulation statistics and other facts concerning North Korean media are unavailable because the government keeps a tight hold on such statistics. DPKR media is primarily used for indoctrination by the government. Choson Chungyang Tongsinsa, the state-operated Korean Central News Agency (KCNA, http://www.kcna.co.jp/ ), collects and distributes officially created and sanctioned information in both Korean and English. Established on December 5, 1946, at P'yongyang, the KCNA prints the daily Choson Chungyang T'ongsin (Korean Central News), Sajin T'ongsin (Photographic News), and Choson Chungyang Yonbo (Korean Central Yearbook), spreading carefully worded news to designated media bureaus. The DPKR's Central Committee publishes party rhetoric in its official newspaper, Nodong Sinmun (Workers' Daily), which is estimated to have a circulation of approximately two million readers. Kulloja (The Worker) also distributes Central Committee theory. The official government newspaper is the Minju Choson (Democratic Korea). Other periodicals provide news for specific occupational groups such as railway workers, military personnel, and teachers. The Foreign Languages Press Group issues the monthly magazine Korea Today and weekly newspaper P'yongyang Times ( http://www.times.dprkorea.com/ ) in English, French, and Spanish. The communist North Korean government uses media to achieve contrasting domestic and international agendas. When he became prime minister in 1948, Kim Il-sung recognized the power of the press to influence North Koreans and to confuse and alarm South Korea and its western allies. Kim Il-sung insisted that the DPKR was the only valid Korean government and emphasized Juche, his philosophy of self-reliance. He occasionally spoke to reporters and emphasized journalism education to support DPKR goals. Kim Il-sung established his dictatorship by developing a personality cult which encouraged North Koreans to glorify him and his family as mythical super humans. Kim Il-sung's son Kim Jong-il received similar public adulation when he succeeded his father who died in 1994. The North Korean press insisted that Kim Jong-il's succession was unanimously supported; foreign media questioned this account and suggested that rivals had unsuccessfully countered Kim Jong-il because he did not assume power until 1997. Government-controlled North Korean media created a biography for Kim Jong-il that insisted he was destined to rule North Korea because natural phenomena, including a double rainbow, had occurred at the time of his birth. In August 2001, KCNA described Russians as being awestruck by Kim Jong-il's visit. The media claimed that rain stopped and sun shone wherever Kim Jong-il traveled and that the Russians revered his power to control nature. Article 53 of the DPKR constitution grants North Korean citizens freedom of press and speech, but protects those rights only if media expressions are supportive of the government and the KWP. Censorship has been implemented as the basis of public media. All print and broadcast media emphasize the need for North Koreans to accept a collective lifestyle for the good of the country and to reject individualism. Membership in the Korean Journalist Union is mandatory for reporters. Foreign print and broadcast media are forbidden to average North Koreans who risk harsh penalties such as forced labor if they attempt to listen to or read any non-DPKR media. Only senior party officials are permitted access to external news sources. Foreign journalists are discouraged from entering North Korea uninvited. North Korean news reports consistently deny that chronic famine conditions exist in North Korea despite evidence that mass starvation and crop failures have occurred. Statistics concerning such natural disasters as floods are not provided or incorrectly reported. Foreign press often obtains facts from defectors. When U.S. President George W. Bush described North Korea as an "evil" country that posed terrorism threats in early 2002, the DPKR media began daily attacks on Bush's credibility and denounced the U.S. as trying to provoke another Korean War. The KCNA issues broadcasts in Korean, English, French, Spanish, and Russian. Reports estimate 400,000 televisions and almost five million radios are in North Korea. Radios and televisions are set to receive only government broadcasts approved by the DPRK Radio and Television Broadcasting Committee. The Korean Central Television Station in P'yongyang and stations in Ch'ngjin, Kaesng, Hamhng, Haeju, and Siniju air broadcasts. 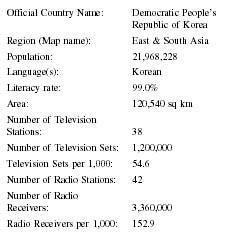 The AM stations P'yongyang Broadcasting Station (Radio P'yongyang) and Joson Jung-ang Pangsong (Korean Central Broadcasting Station) and P'yongyang FM Pangsong (Broadcasting Station) are the main domestic DPKR radio media. Smaller stations air local programming to individual communities. Some large stations exist that issue international broadcasts. North Korea also broadcasts in the Demilitarized Zone (DMZ). The DMZ is a frequent topic in DKPR media because it is a sore point in international relations. DKPR press and other media sources often issue conflicting reports regarding the instigation of conflict in this area. "The Hungry North." Economist 336. (July 1, 1995): 26. Kim Il-sung. Chongsonyon kyoyang saop e taehayo. Pyongyang: Foreign Languages Pub. House, 1974. Savada, Andrea Matles, ed. North Korea: A Country Study . 4th ed. Washington, D.C.: Federal Research Division Library of Congress, 1994.